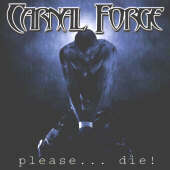 Carnal Forge is definitely taking shape as one of the prominent bands of the new thrash madness movement in metal. Utilizing the same raging speed and intensity of Soilwork, as well as some of the crunching and ripping precision of Ebony Tears, the band definitely has a solid hold on the growing niche of melodic thrash metal. The most impressive aspect of the musicianship on this album is definitely the string-work. The guitars create all the melody and variation on the album, ranging from solid riffs to some fantastic and unusual licks. While the rhythm section is as taught as a high-wire, it seems that its main focus is to blind the listener with blistering speed which can only allow so much room for growth and diversity. Instrumentally, this is where the band needs to take a breather and weigh out the benefits of rigid speed versus dynamic varying speed. Interestingly enough, while I enjoy the vocal performance and wish that there were many more bands out there that would have the balls to use thrashy screams rather than the ever-safe black metal scream, the vocals of Carnal Forge seem to suffer a similar fate as the percussion; there are not enough dynamics to create the melody or to give a unique edge to individual songs. Once again, I want to say that the guitars hold a massive intensity and creativity that carries this band well above the mediocre. Bottom Line: A speed thrashing good time with balls of steel, but thirsting for a few more dynamics to give it an edge above the best.